Top seeds Michael Cambareri and Mark Havrilla won this year’s Inland Empire Open with scores of 4.0. Mark beat Michael in round four, but was held to a final round draw while Michael scored a comeback victory in a fascinating game where his opponent had four pieces for a queen! Michael had the only perfect score after the first day’s action while Mark took a Saturday night bye to enter their showdown battle one half point behind. A total of 29 players (and one house player) took part in this year’s installment of Spokane’s oldest weekend tournament. While Michael had the perfect score after the first day and Mark was the only returning player at 2.5, there were nine other players who finished the first day with 2.0 scores. That made for a bunch Wallaceof closely contested games on the final day — and the bunched up standings reflected the close nature of the competition. Four players finished third with scores of 3.5: Brad Bodie, Jonathan Geyman, Dan McCourt, and Karl Reutter. Jonathan, a rapidly rising provisionally-rated player, was also the top score in class C, while the other three also shared the class A prizes. The class B prizes were shared by Jason Cross and Kevin Korsmo with scores of 3.0. Second place in class C was shared by Walter van Heemstede Obelt and Ron Weyland, both of whom scored 2.5. Walter’s accomplishment was particularly impressive in that he was only able to play the first day due to work commitments. Steve Wallace(3.0) won the class D first prize. Second in that section (at 2.5) was shared by Logan Faulkner and Rob Harder. Rob also scored a 606 point upset victory in the first round to claim the top upset prize. The tourney also featured six unrated players participating in their first USCF tourney. Note: Jonathan Geyman also won the open division at the small unrated Lou Domanski Chess Festival in early April, beating James Stripes in round four. The last round had two teenagers on board one. Jonathan and Benjamin Nylund, who recently moved to Idaho from New Zealand. The Lou Domanski Chess festival had been known as the Sandpoint Community Chess Festival until renamed three years ago. It was started by Lou Domanski 26 years ago. Stripes has been the event’s TD since 2009. CLICK HERE for the pictures I took during the first round on May 20, 2016. CLICK HERE for the link to the xtable. Taken for a Facebook post by Spokane Chess Club. “INLAND EMPIRE OPEN — THREE’S A CROWD!! This year’s installment of the Inland Empire Open ended up with the top three seeds sharing first place and claiming the prizes for first, second, and third. Michael Cambareri, Michael Murray and Pavlo Zaborskyy all scored 4.0 to top the 28 player field. Five players had finished the first day’s action on top of the leader board. The only two perfect scores to play in the third round — top seed Michael Cambareri and Gordon Higbie — fought late into the night before drawing the day’s final game. They were joined at 2.5 by Mark Anderson, Garrett Casey, and Michael Murray, all of whom took third round byes. The fourth round saw Cambareri topple Anderson and Murray defeat Higbie, while Zaborskyy stopped Garrett Casey. Zaborskyy won his final game and then everyone watched while Cambareri and Murray fight four hours before drawing when Michael, with one second left, lost his pawn advantage in the time scramble. The class A prize was won by Brad Bodie (3.5), while Gordon Higbie was second at 3.0. Mark Anderson took first in class B with another 3.5 score, while Garrett Casey took second at 3.0. Class C saw a tie between Nick Martonick and Tito Tinajero, both with scores of 3.0. First in class D went to Jim Burney with 2.5, while 2.0 scores gave second place to Arlene Bodie, Jim Waugh, and Ron Weyland. Ron also claimed the biggest upset with a victory in the first round over an opponent rated 477 points higher. CLICK HERE for link to the xtable. NM Jim Maki of Coeur d’Alene and Michael Cambareri each scored 4.5 to share top honors in the 24th annual Dave Collyer Memorial played February 27-28, 2016. Third place (4.0) was shared by Viktors Pupols, David Arganian, Steve Merwin, and Mika Mitchell (with Arganian being top Expert, and Merwin & Mitchell topping the class A category). This year’s event, played in Millwood, drew 59 entries (plus two house players). Top seed Maki suffered a second round draw, moving second seed Pupols to board one for the rest of the event. The two met in the fifth round while Cambareri battled Mark Havrilla on board two. Cambareri’s attack broke through and gained him the point. Meanwhile, Maki and Pupols battled until they were the last game going. Maki pulled out the win and joined Cambareri on top — the first Collyer victory for each of them. There were a lot of other prize winners. First place in class B went to Steve Buck (3.5), with a crowd of Steve Fabian, Dan McCourt, Jim Skovron, and Jeremy Younker sharing second at 3.0. The two class C prizes went to youth — Nick Havrilla and Garret Casey each scored 3.5 to win their class prizes. Five players scored 2.0 to share the class D prizes: Arlene Bodie, Hedda Campbell, Jeff Jaroski, Colin Phelps, and Bill Rottmayer. The class E and unrated first prize went to Anthony Raelund (3.0), while another newcomer, Dr. Shancie Wagner (2.0) claimed the second prize. There were quite a number of upsets, including eight victories over opponents rated at least 300 points higher. The prize winners were Cecelia Valeriote (687) and Ted Baker (486). US Chess Xtable CLiCK HERE. For more photos by James Stripes CLICK HERE. Tournament Winner: Michael Cambareri on left and TD Kevin Korsmo. 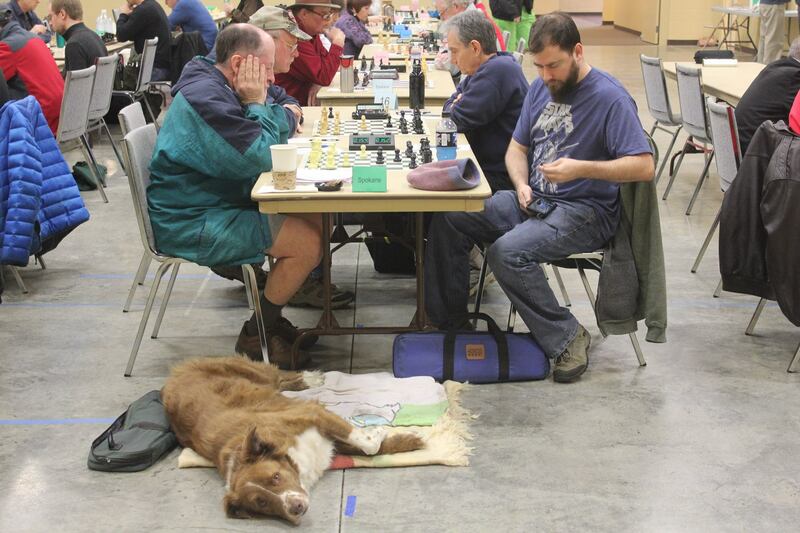 Kevin Korsmo directed the 30 player event on Sept. 26-27, 2015 for the Spokane Chess Club. CLICK HERE for the US Chess crosstable. CLICK HERE for USCF Crosstables. James Stripes of Spokane won the event held on August 15-16, 2015 with a score of 4 wins and a half point bye in round 3. Steven Merwin of WA and Brian Woods of Ohio scored 4-1 to tie for 2nd. 30 players took part under the direction of David Griffin of Spokane. 4 of the 30 were playing in their first USCF rated events. The same weekend a 4 game match was held for the Spokane City Chamionship between Michael Cambareri and Nikolay Bulakh. Those games ended with 2 wins each so a tie break of 5 games at G/10 d3 was held. Michael won that 3-2. A report from the Spokane Chess Club Facebook page. James Stripes won this year’s edition of the Spokane Falls Open which attracted 30 players, many of them new to the sport. Stripes won all four games he played and enjoyed his “old man’s bye” on Saturday night. He stopped top seed Steve Merwin on board one in Sunday morning’s fourth round, and then defeated Kairav Joshi (also 3.5 by way of a Sunday morning bye) in round five. Merwin and Brian Wood of Columbus, Ohio finished second with scores of 4.0. Woods suffered his only loss to Joshi in round three, but secured the u/1800 prize for efforts. The winners of the u/1600 prize, with scores of 3.0, were Garrett Casey, Sam Comi, and Mitch Kilayko. The u/1400 & unrated section was won by newcomer Anand Wadikar (3.5), who secured a provisional rating of 1803 for his first tourney! Second place (3.0) in the section was shared by Braxton Casey and Ron Weyland. Braxton also won the prize for biggest upset, with his 353 point victory edging Sam Comi‘s 346 point upset! The event was played in conjunction with the City Championship match between Nikolay Bulakh and challenger Michael Cambareri at the Schoenberg Center at Gonzaga. Cambareri won. His photo below. Couple of Spokane CC Events have been rated. CLICK HERE for a one day event. CLICK HERE for a month long event of 5 players. Kevin Korsmo and David Griffin tied for 1st place with 3.5-.5 in a event held May 14. CLICK HERE for the USCF crosstable of the event. 10 players April 30 thru May 7, 2015 took part in a G/60; d5 event under the direction of David Griffin. Travis Miller won with 3.5-.5. CLICK HERE for the USCF crosstable. Spokane Winter Championship (ended Feb. 26) – Darren Russell won with a perfect 5.0 score, raising his rating from 1898 to 1955. USCF cross table link. Seattle February Tornado (Feb. 22) – Dereque Kelley won with a perfect 4.0 score, raising his rating from 2192 to 2208. USCF cross table link. 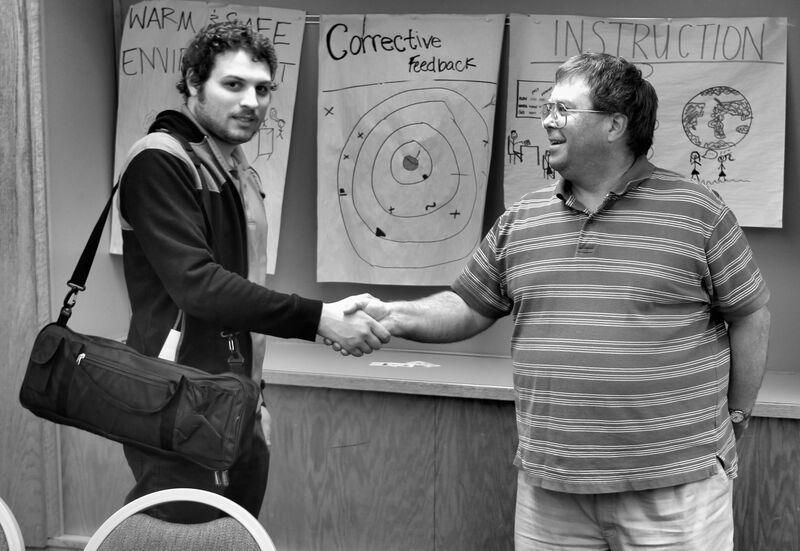 Portland February G/60 (Feb. 28) – Nick Raptis and Michael Goffe tied for first, each with a perfect 4.0 score. Had there been another round, they would have played each other in this 31-player event. 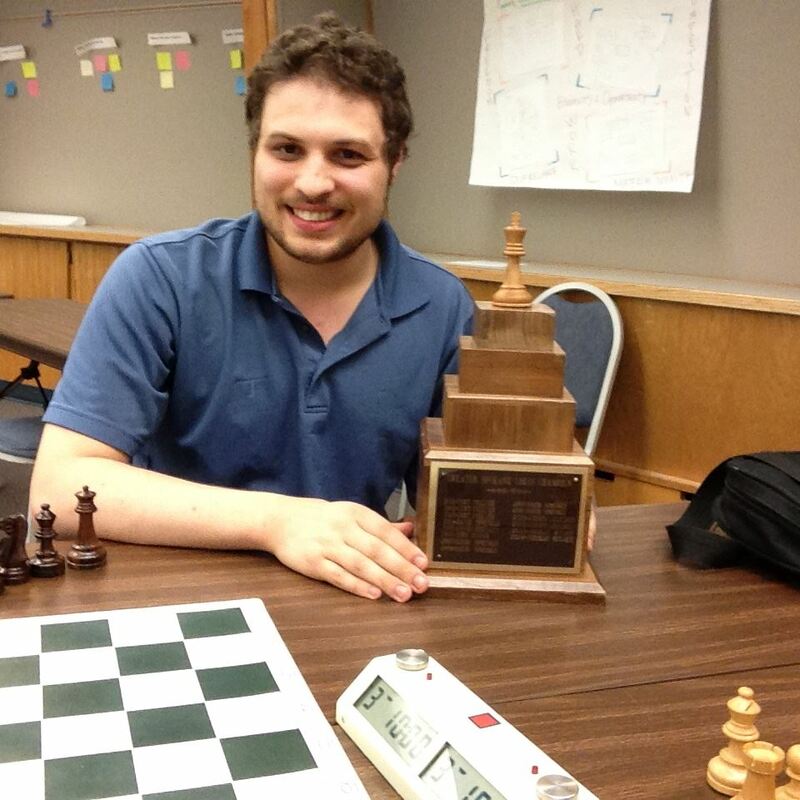 Raptis, who is also the Oregon chess champion, is now rated 2402, and Goffe 1931. USCF cross table link.